Aside from being a very talented executive chef, Luigi loves to travel and is a motorcycle enthusiast. Here is a photo of Luigi and his custom made bike with leather seats. During our trip to Seminyak, no other night stands out to me the way our evening at Zibiru does. Laced with romance, tucked away from the main road traffic, in this picturesque, open air Italian restaurant, all of the elements of an unforgettable fine dining experience come together in harmony. Every detail is thoughtfully put together, from the regional Italian cuisine made with fresh ingredients, to the elegant ambiance. 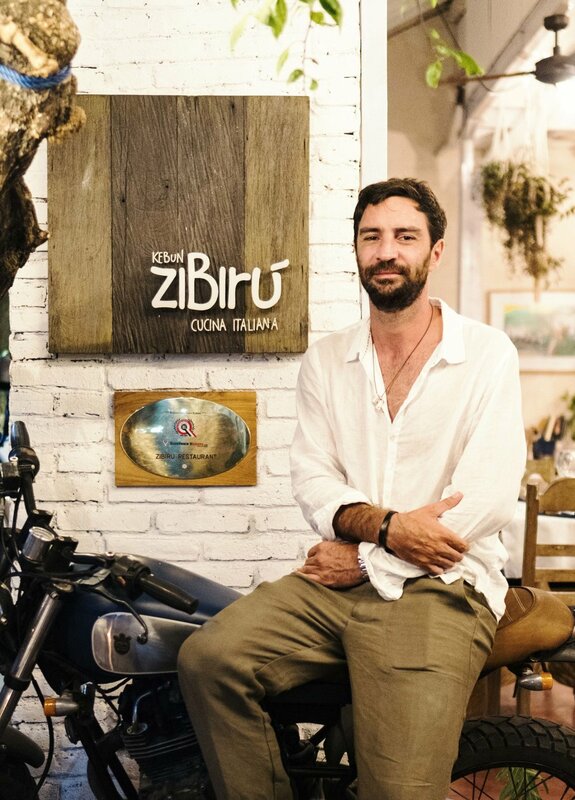 We had the opportunity to catch up with the owner and executive chef, Luigi Calcagno, to tell us a little about himself, the story of Zibiru and what’s next for the restaurateur from Luxembourg. Growing up, Luigi always possessed a passion for cooking, learning to make fresh pasta from his grandmother and preparing his first ever dish alone at the age of 13. While he was attending university in Luxembourg for journalism, he felt himself pulled to see more of the world. His travels took him throughout Europe, where he ended up working in multiple different kitchens to make money on the road. At the time, he thought his path was to become a food critic, but after realizing some of the realities of the job, his vision broadened and he started thinking that maybe he would create a restaurant of his own. We also had the pleasure of meeting of Luigi's mother who is also a world traveller and was visiting her son from Italy. Before moving to Bali 10 years ago, he spent a short period of time living in New York, which he says was one of the greatest experiences of his life. The city taught him a lot of life lessons, and opened his perspective to how people function differently around the world. In 2012, Luigi’s vision for a gourmet, farm to table, authentic Italian fine dining restaurant came to life. We found out the establishment we were standing in was actually his first ever home in Bali, it’s where the story of Zibiru began. He slowly remodeled the building, taking down a wall and opening up rooms here and there, then building a huge kitchen that would eventually produce all of the food for 6 restaurants.